Your heart was consumed by it but your head knew it was fleeting. It was the difference between childhood crush and adult love. Transpose that to music and my crush was Bowie. Then in ’93 he released an album I didn’t, and still don’t, like. He took his eye off the ball and Suede swooped in to take advantage. He got me back in ’95 but Suede had taken hold by then – maybe they did it so easily precisely because they were so in thrall to Bowie too. The press, as is their way, built them up and then rubbed their hands in glee when Bernard Butler left and their sprawling, insane, brilliant second album Dog Man Star, and its preceding single, Stay Together, fell into wreckage. 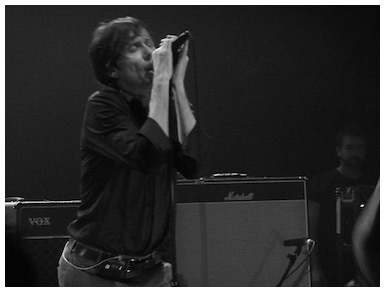 But Brett Anderson had always been stubborn, he recruited a 17-year-old Suede fan to replicate those guitar parts perfectly and then the press had to shut their mouths as the band produced their most successful and hit-packed album, Coming Up, in ‘96. Anderson/Oakes wrote better pure pop songs than Anderson/Butler. They weren’t ambitious but they were irresistible. I was there until the bitter end, seven years ago, as they bowed out with the forgettable A New Morning. 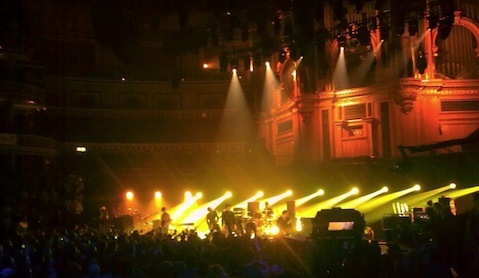 And then, at the Royal Albert Hall this week, I found that most unimaginable of things – the band I cheated on my crush with had not been dimmed by age and the ardour I felt had not been extinguished by the passing years. I pondered aloud, on these very pages, in a Brett Anderson review in January whether youthful love had blinded me. That in adulthood I feared finding the music dated and shallow, unable to stand the test of time. Half way through the show, after a breathless Metal Mickey, the applause carried on, and carried on, until it became a full standing ovation. One by one each of them broke into a smile, finally stopping the breakneck pace of the show, and started to take in the wave of love and gratitude coming at them. Even the impermeable Neil Codling, on guitar and keyboards, broke rank. Always a Suede song made flesh, all pale glamour and high cheekbones, he broke character and took in the moment, his first Suede show for nearly ten years. Solid and cool on bass and drums, Mat Osman (now a magazine editor) and Simon Gilbert (living in Thailand, now a member of punk rock band Futon, big in Asia apparently) joined him, exchanging smiles. Richard Oakes, the teenager who never felt the weight of what he was replacing, remembered that the first gig he went to was Suede. He made this possible. A contented smile covered Brett’s face, visibly overwhelmed by what he had not felt for years. His more self-conscious moves gone, he had retaken the vibrant leader role and made it his again. He still knew how to do this, becoming the focal point of the collective energy of both band and audience. He revelled in it because he hadn’t spent the preceding seven years chasing it. We jumped and sang and rejoiced, but that was the thing, I wasn’t reliving my teens. It was all happening now, right now, it wasn’t some flashback – this music was still great. Everyone felt it and it was better than when we were young, as if none of us had aged. I saw them at the Manchester Apollo in ‘96 and given that Coming Up was the first record they’d made with Oakes writing and playing, it was deemed best to not play anything from the first album. They did play some of Dog Man Star but Animal Nitrate et al were too hard to face. I never did get to hear those debut album tunes then but there they were in 2010, we heard it all - B-sides, album tracks and hits. They could have gone on for another half hour playing songs there were no time for – We Are The Pigs, Still Life, My Insatiable One, By The Sea, Sleeping Pills and Stay Together (never likely, the band disowned it when it came out). But nothing like that mattered. Everyone just forgot how the years had passed, how we’d all grown up, how we were tired of our office jobs, and we let the music do what it does. The press wrote them off as foppish posers, after once declaring them the most exciting band in England, and they never got the respect they deserved. No more. It was undeniable. A childhood crush lasts forever; it stays with you, frozen in perfect time. But your first love fades, as it’s supposed to. Sixteen years have passed since my first love. I imagined what it would be like seeing him now, still looking the same as in ‘94. My heart would jump; there would be no letdown. It would still mean everything.